North is a big brand as in very well known around the world, but also in terms of the amount of different types of hardware. For 2016 North has roughly 8 different kites, 10 twintips and 8 different wave boards. An incredible amount and most of them are redesigned every year. Is this redesign a marketing driven thing or can we pin point some real improvements? To give you an hint; most North quiver is not really changed but tweaked. We had the chance to ride most of the 2016 equipment for a couple of hours. Below you will find some highlights of the first impressions we had from it. 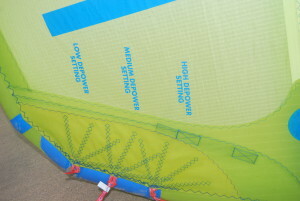 In a further stage we give you more detailed reviews on all main stream kites and twintips. 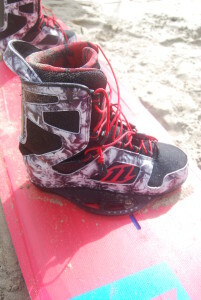 The Jaime has been in the North kiteboarding range for over ten years. We rated the 2015 version as a fast, upwind miracle but a bit stiff. It clearly is faster than the more comfortable (especially on the landings) Team Series but also has less pop. Apart from the graphics hard to judge in one session if the 2016 version really feels different from 2015. However it’s outline for 2016 is definitely changed. It’s wider to make you pop better and your landings easier. According to North the new Jaime is now more a freestyle board with a new Carbon Beam construction, which should give the board a lively and eager feeling on the water. seen before with other boards (like the F-one Acid, labelled as new School or the wake-style performance Bucca from Vanhunks) using the Gambler out of its intended usage is a big no-no. If you use where its meant for this, hit the park on the kite or the cable, the 2016 Gambler has a real nice new feature: The Track System is positioned in one line, so boots can be ridden on both edges. This way the Gambler can be switched and used -in theorey- much longer. The new double concave offers quite good grip so you should easily be able to ride it without fins. The 2016 POP boots clearly changed a lot from 2015. They seemed changed both in shape (wider nose) and stiffness. Although it is a bit unfair to compare a used (2015) boot to a new boot, it still felt like the 2016 POP boot is harder, not to say less comfortable, on the inside. 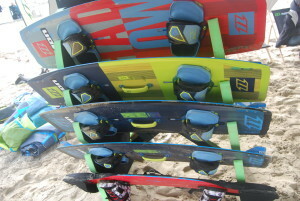 The Team Series board, now at 999,- Euro’s, is part of the top end line of North. We reviewed the 2015 version concluding it, although not being the fastest or at its best going upwind, has a good combination of pop and comfort. The first few sessions we had with the 2016 version of the TS didn’t reveal any major differences. 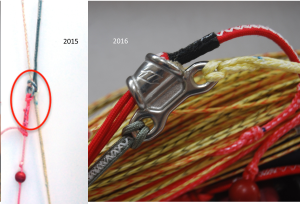 Some details did change, like the shape of the bottom, specifically the bottom side has different channels as in 2015. Something to investigate further when we have a chance to ride the board a bit longer. The non bridled 100% freestyle Vegas is tweaked up a bit from 2015. The Vegas -of course- still needs a fair amount of input and probably has the worst wind range of all North kites, but when used properly in the right conditions (which is not too underpowered) is the most rewarding kite from the North range. It has almost unlimited setting options, both on the bridles as on the tips (on the contrary for example to the Rebel which just has one option). Aaron Hadlow gives his explanation on the different settings in a video here. 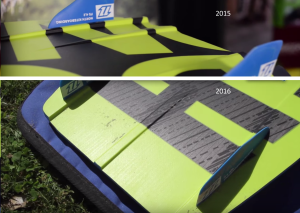 To judge the changes to the 2015 version we need to take the kite out a lot longer, which we certainly hope to do so. If it was a fish, the Dice would be a dolphin; friendly, playful, fast and everybody likes to touch it. The Dice, 2015, was our favourite North kite. A good cross over kite if you can’t choose, usable for most riding styles and probably the best choice for 90% of the kiters out there. 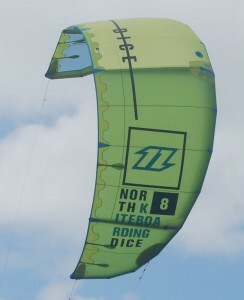 For this reason the Dice will have our first review on the 2016 North kites. And yes, the 2016 version has been improved from 2015. Smoother and a bit more low end. The old time favourite for the numerous freeriders out there. It’s the ultimate jumping machine with exceptional hangtime. The Rebel has it’s own kite category. You hate it or you love it. Although not my favourite type of kite, it’s North’s pinnacle for a long time. And there is a reason for that. The low end of this kite is really incredible and jumping is made very easy. You don’t have to be technically perfect to boost huge airs. Nothing has changed so far in 2016. The pop is amazing and hang-time is like before, crazy. The low-end keeps surprising when everybody is on foil kites or 14+ a rebel 12 does the job. The kite is a bit more technical then others, its doesn’t like that you keep pulling the bar, it needs a little bit of breath before it gives what you expect. The aspect ratio of the 2016 kites have been changed. The smaller sizes in the range now feature a lower aspect ratio while the bigger ones got an higher aspect ratio for higher jumps and better hangtime. The 2016 Quad bar didn’t change much except for one major detail. The way the front line split and how it works out when using your safety release has been redesigned completely. It now has a metal tube connection where the 2015 version just had 2 rings. We didn’t like this 2-ringed solution North came up with (initially end of 2015 The North Quad bar turned up with a square piece of plastic which damaged the front line). The 2016 split looks much better, but has one disadvantage; The front lines are unequal in length. A small detail which will only be a hassle when replacing one of them; Ordering it at your local shop you should at least give the following information: “Can I have the red front line, 22m, 2016, North Quad bar version please”. For the rest this amazing multi adjustable bar (have a look at the 2016 5th element video which explains also the Quad features) is unchanged from 2015. Most of the products described here are already for sale. Please note that not all 2016 versions (for example the Evo) are on the market yet.